The desire to get back to nature surfaced again and again over the week. I found it interesting how many times the thought to plan my walk came to my mind throughout the week and especially during my Morning Pages. I felt like it was a time that I did pamper my artist with high quality air and greenery. I also notice that my artist is feeling rather shy when out and about these days, so I decided to pick a more secluded location where I would be less inhibited. I consider this a perk of living near the country. There are times when the quiet is so important. I chose to go to Battle Ground Lake for my walk. As I walked down to the lake I noticed that it took my eyes several moments to begin to come into focus with the details around me. A handful of fisherman were along the dock and shore line. There was a stillness. It crossed my mind that these guys have the idea. They are out there with the stillness of the lake. Every noise that the animals make echoes and is amplified. I looked out on the lake and notice birds lined up on floating logs. I regret not bringing my high powered lens to get a shot. I only realize that these were ducks after the one at the end of the line stirs and flies off and lands in the water with a splash. I decide that I want to go around the lake’s lower trail in order to get in a nice brisk walk. I remember that it is only a mile around and think that it should be no problem to complete before the sun gets low in the sky. As I begin around the trail a small animal in the bushes scurries away. I am just as started by its noise as it was by mine. I get a chance to go right down to the water and a fish scares and splashes away from the bank’s shallow water in a hurry. During this time of year when the park is mostly forgotten, the wildlife must also have that feeling of being safe and alone. I get almost a third of the way around the lake before the trail is covered with water and I must turn around. It is then when my eyes really come into focus and I begin to see all of the interesting things around me. Steam was rising from a floating log in the water, ferns were growing out from the most unusual places, a tree trunk which could pass in a Dr. Seuss landscape. The old lesson that the artist’s eye is an eye of detail once again manifested itself to me. I could hear many sounds of the little critters all around. One must slow down, really slow down if one expects to see the beauty that is missed by many. It was on this date all alone that I was able to relax enough to really let go of an agenda of having to go, go, go. 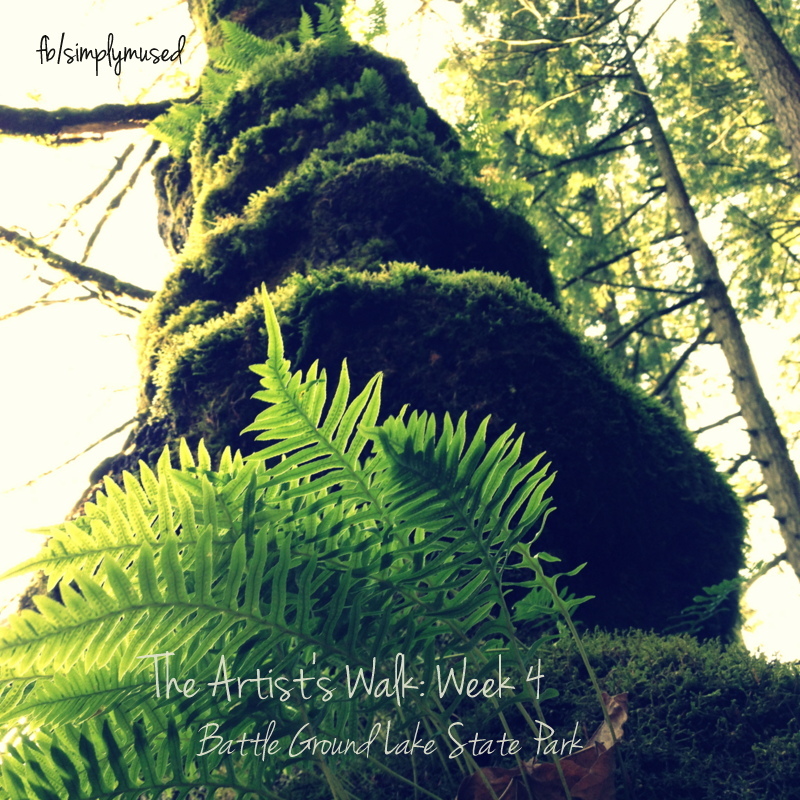 This entry was posted in Artist's Walk and tagged creativity, nature, solitude, The Artist Way, the artist's walk, walking. Bookmark the permalink. I feel more relaxed just having read your post. Thank you.